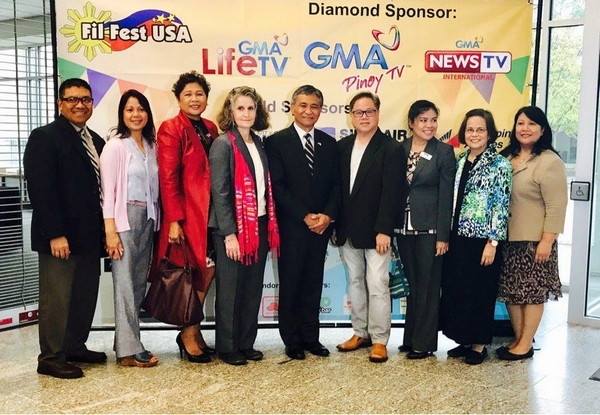 The Cagayan de Oro City Committee of the Norfolk Sister City Association actively participated in FILFEST USA 2017, the annual celebration of Filipino-American Culture in Hampton Roads, Virginia, as one of its major sponsors. 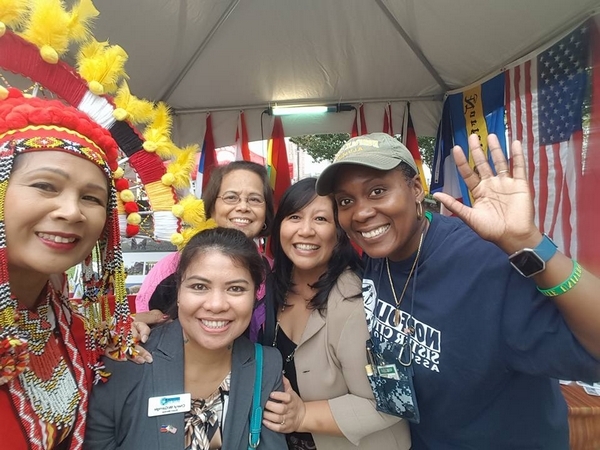 Hosted by the City of Norfolk, the event held last 14-15 October and kicked off a public event at MacArthur Memorial featuring the special recognition of our Filipino World War II Veterans. Major General Antonio M. Taguba, Chairman of the Filipino Veterans Recognition and Education Project, spoke about the national campaign of the Congressional Gold Medal (CGM) award to be given of Filipino World War II Veterans. Gen. Taguba also spoke on the fundraising campaign to provide funds to mint a single gold medal. CDO-NSCA committee members pose for posterity with Maj. Gen. Antonio M. Taguba (Ret) (center). For more information on how to avail of the gold medal here www.filvetsrecognition.org. 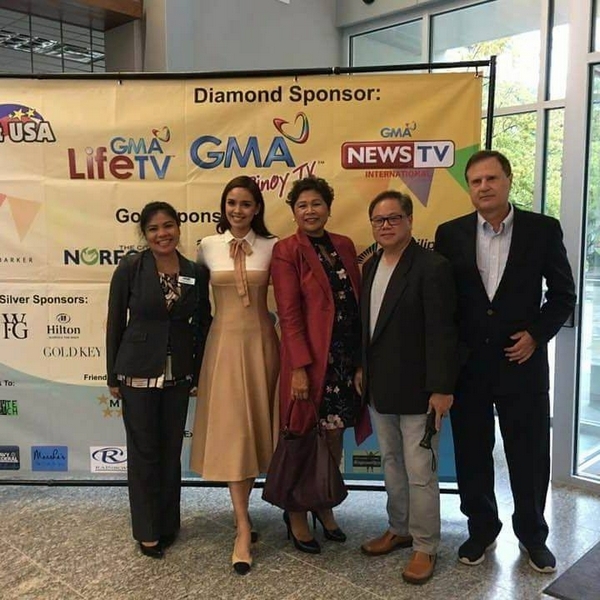 The event was held 9am to 9pm with the grand finale crowning Ms. FilFest 2017 graced by Megan Young, Miss World 2013, sponsored by PAL. 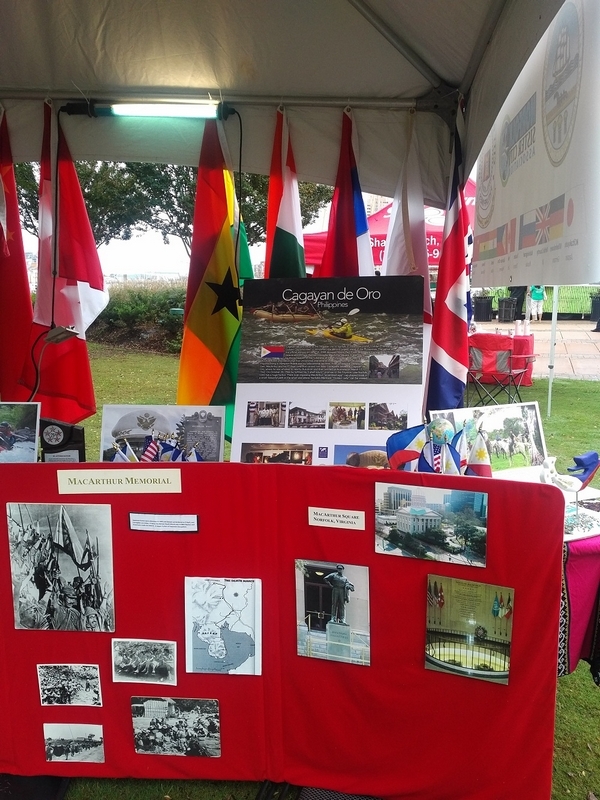 The NSCA-CDO booth was decorated with the national flags from all of Norfolk’s 11 sister cities. Harry Acuña took charge of making the big banner with the official city seals of Norfolk and Cagayan de Oro. He also made mini poster about CDO tourism. CDO committee members handed out flyers about CDO, promoting and recruiting new members. 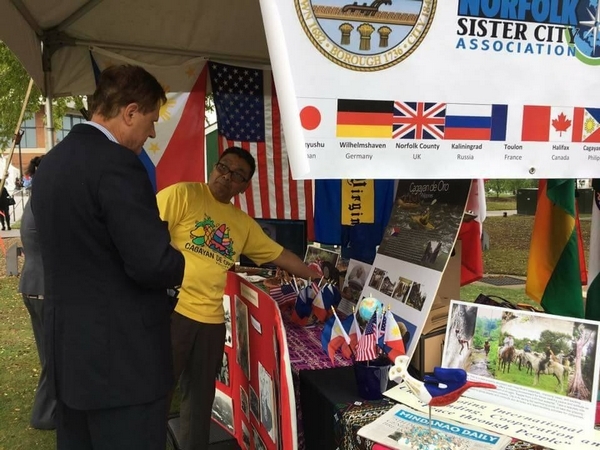 NSCA-CDO booth ablaze with the national flag colors of all nine NSCA sister cities flags. 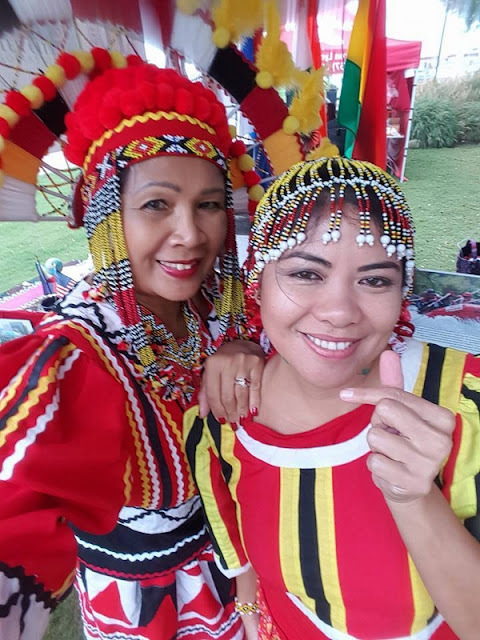 Raylene Ann Baumgart and Cheryl McGarrigle in their Higaonon costumes at the CDO Committee NSCA booth at FILFEST 2017. 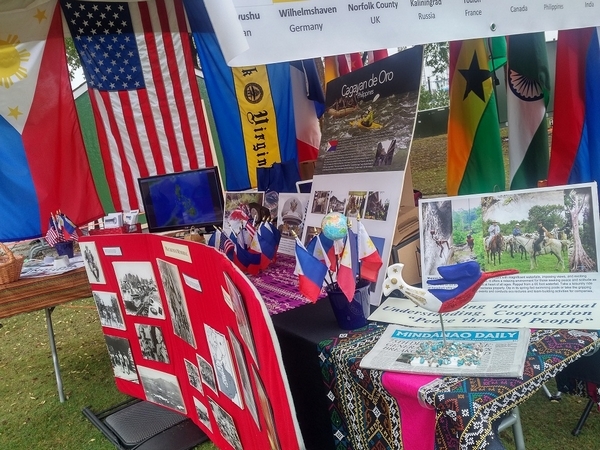 The CDO Committee-NSCA booth also featured a General MacArthur visual trifold pictures presentation to engage and invite people to join our MacArthur Museum project in CDO. We also an all day a powerpoint presentation compiled by Harry Acuña that featured the history and making of our MacArthur Memorial Markers in Cagayan de Oro and Manolo Fortich, Bukidnon; NSCA-CDO accomplishments, the first NSCA Sister City Adult Exchange with CDO in 2016, the 75th Diamond Jubilee of the MacArthur Breakout re-enactment in CDO and Manolo Fortich, Bukidnon; the Golden Lady mermaid and other relevant pictures. Harry Acuña points out the Gen Douglas MacArthur Marker of CDO to a visitor. The CDO booth in general was well visited and most colorful decorative booth. The CDO committee would like to thank our partner in Cagayan de Oro especially Mike Baños, the staff who helped Harry Acuña, the Cagayan de Oro Historical and Cultural Commission (HISCOM), City of CDO, Office of City Mayor Oscar Moreno for supporting CDO events in Norfolk, VA.
CDO booth and volunteers with guest. The NSCA-CDO Committee 2017 includes Cheryl McGarrigle, Chair; Dr. Juanny Montero, founder; Joseph Juaneza Solinap, Raylene Ann Baumgart, Harry and Christine Acuña, Nora Dorsey, Araceli Suzara, Dory Morrison, and Guia Caligawan.